Vivienda antigua, completamente reformada, de 200 m2 distribuidas en 2 plantas, unifamiliar, en un entorno privilegiado con fantásticas vistas al mar y acceso al Club nautico y al puerto de Javea a tan solo unos minutos andando. La vivienda consta de 5 habitaciones (4 dobles y 1 sencilla), 3 WC completos, gran salon comedor con vistas impresionantes, cocina completa, despensa y patio interior con lavadero y barbacoa. Preciosa vista de la bahía y el puerto . We were heartly welcomed by Maria and her husband Vincent. Great hospitality - thank you so much! It is a fantastic villa with very nice furnitures and an extremely well equipped Kitchen. Imagine if all villas were like that! We can highly recommend the villa! Thank you very much for your good comment. It was really a pleasure to have met you. A truly fabulous home directly overlooking the charming working port of Javea. We were lucky enough to spend a sunny winter month here and the view feeds the soul every day. Maria is a lovely host and the house lacks for nothing , in fact, there is at least two of everything. We fully intend to return. If you're looking for a holiday home close to the port and a moments walk to restaurants, the shops, and the ocean, then this home is for you! It certainly worked for us and we had a great stay. Everything was clean, the home was comfortably furnished, the kitchen was well equipped, and just a few minutes watching the world go by from the terrace and you know life is good. We were made very welcome when we arrived and were able to relax and enjoy our holiday. Highly recommended! What we booked is exactly what we expected, with an interesting family home near all amenities. The hosts were utterly charming. The terraces had great views and the internal courtyard provided much appreciated shade from the heat of the day. We would recommend anyone to book this lovely home. Really charming guests, they do look after the house as if it was their own. And we are deligthed that they enjoyed the house. 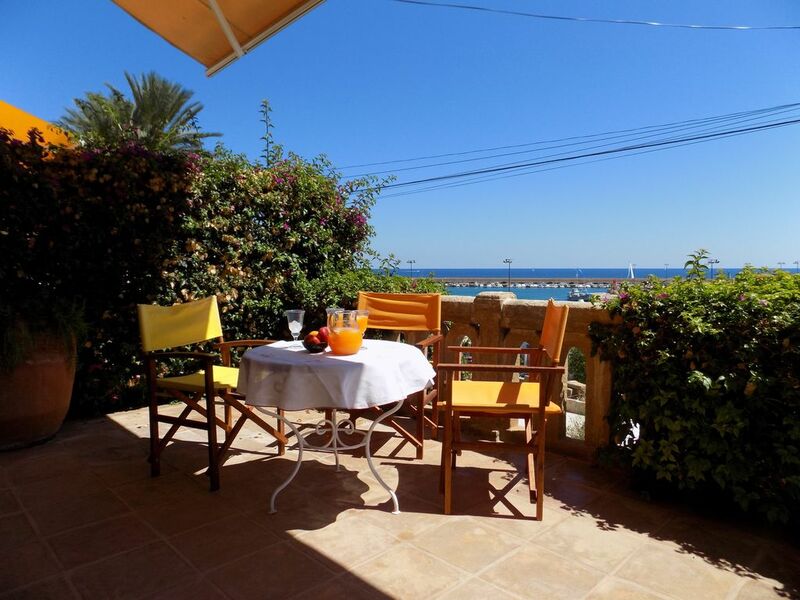 Maria and her husband are the most wonderful hosts, their house is charming with all the comforts of home and in possibly the best position in Javea. We spent many happy evenings on the terraces overlooking the port, after dining in one of the fantastic restaurants just along the beachfront. Thankyou for a wonderful stay in Javea, best wishes from Rosalind. Vivienda unifamiliar situada en el puerto de Javea, con una ubicación magnífica para disfrutar de la playa, de las vistas , proxima a muchos restaurantes, tiendas y supermercados , sin necesidad de utilizar el coche. Goza de las ventajas de estar céntrica y tener un emplazamiento tranquilo frente al mar. Estancias de cuatro semanas o más , se aplicará un descuento del 25% , excepto para los meses de julio y agosto .